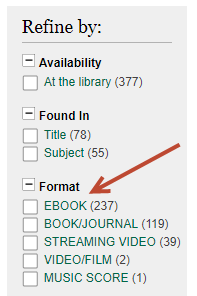 To limit your search to E-Books only, first access the library catalog. From here, click on the Books & Movies tab and search your subject. On the search results page, you can refine your search with the limiters in the left column. Under format, check EBOOK. Your search will yield only E-Books that you will be able access. When you find a relevant book, click on the title. This will bring up the item record. To access the book, click the Northwest: Click to access link. If you cannot find a book that will work for you, you can also try searching in one of our other E-Book databases.